The Kines Motor Company and Builders Center are the Barbour County Chamber of Commerce Members of the Month for November. Ron Phillips, left, is the Manager of the Builders Center. 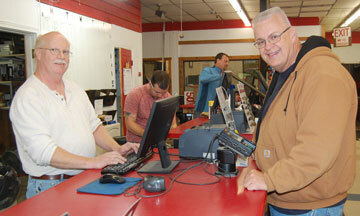 Jim Kines, right, is the owner and Sales Manager of Kines Motors. Kines Motors boasts of being a small dealer with a low-pressure sales environment in which purchasing decisions are unforced. Kines offers the local agricultural industry the equipment, parts, and service needed to manage a successful farm, he says. The company’s three major brands include New Holland, Kuhn, and Bush Hog. Builders Center is Barbour County’s only full-service business providing building materials, such as doors, windows, cabinets, hardware, plumbing, electrical supplies, tools, paint and floor coverings. The company is proud of its service-oriented employees who boast many years of experience in helping customers and who provide prompt delivery service as well, Phillips says. Manager Ron Phillips is a Philippi native and Management graduate of Alderson-Broaddus College. He was employed by Builders Center since he was in high school. He is a Past President of the Barbour County Chamber of Commerce, President of the Philippi Development Authority, a member of the Barbour County Board of Education, and is Chairman of the Board of the Mount Vernon Memorial Church. He received a Directors Special Award from the Chamber of Commerce in 2008 for service to the community.